Tonight, Ireland face Russia in Tallaght Stadium in a crucial World Cup Qualifying fixture, following Ireland’s narrow defeat at home to Germany last month. Ireland will be battling Russia for second place in their Group, to secure qualification to the play-off stage of the tournament. Kick-off is at 7:30pm. Although they experienced an agonising defeat to Germany, the team should take confidence from their performance. 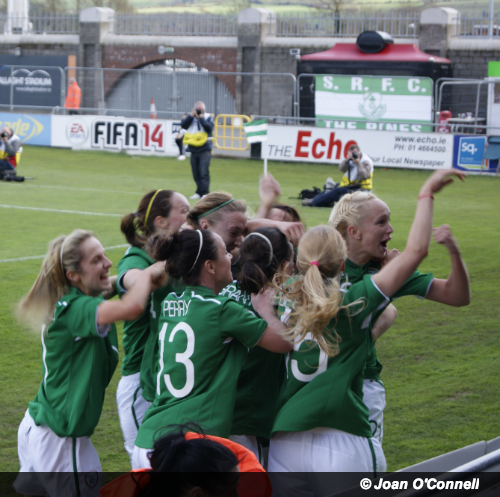 Ireland held the European Champions to a 1-0 lead for over an hour of the game, before Germany managed to equalise. Ireland’s opening goal came just three minutes into the game when Louise Quinn headed the ball in, thanks to a monster throw-in from Megan Campbell. That was to be the first goal conceded by Germany in their qualifying campaign to date. Germany only managed to equalise in the 65th minute through a penalty kick, following a foul by Quinn on Anja Mittag. The score remained level for almost twenty minutes, before Lena Lotzen gave the visitors the lead in contentious circumstances, when Ireland keeper Emma Byrne vehemently claimed that she had been fouled. Just five minutes later, and with another massive throw-in from Campbell, Stephanie Roche put the ball past Nadine Angerer in the 89th minute, to make the score 2-2, causing the stadium to erupt. Devastation came in the first minute of extra time, however, when Germany knicked the winner when a ball in from the wing by Melanie Leupolz looped over Byrne’s head after the keeper had come off her line. Despite the result, however, Ireland will have learned much from their meeting with Germany. Not only did Ireland – the world’s joint-30th team – come close to holding the European Champions and second-best team in the world to a draw, but Germany conceded – twice – for the first time in their 2015 World Cup Qualifying bid. Not only that, but Germany – who, until now had been scoring goals for fun – managed to, eventually, only get three into the Irish goal (one from the penalty spot; one in disputed circumstances; and one which may have been intended as a cross). I’d say that’s good going, in the grand scheme of things, and sets the team up well for tonight’s fixture. When? Wednesday, 7th May 2014 at 7:30pm. UEFA will run live updates here. The FAI will be live tweeting events here.